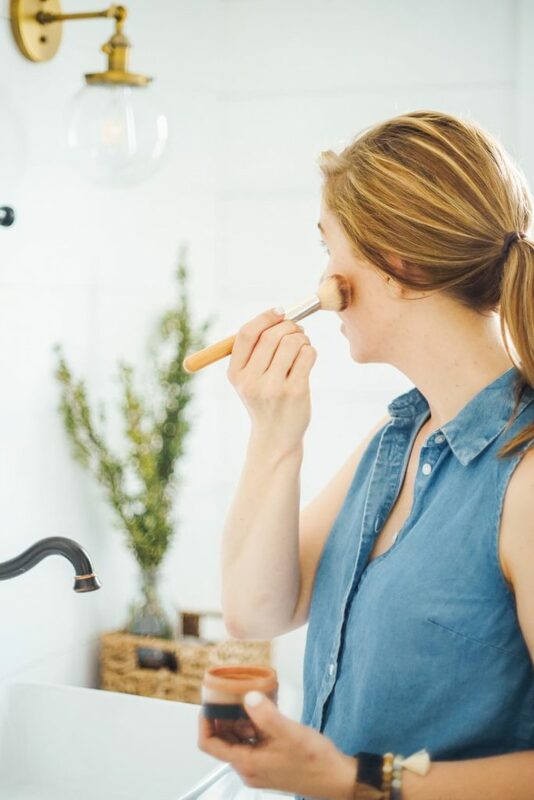 When I first started making the switch from the mystery cleaning and bodycare products that filled our home to more natural products, I didn’t give much thought to safety. Anything that’s natural must be safe, right?! As I experimented with more homemade products, and also searched for “cleaner” store-bought alternatives, I began to think about how to safely make, keep, and use these products. 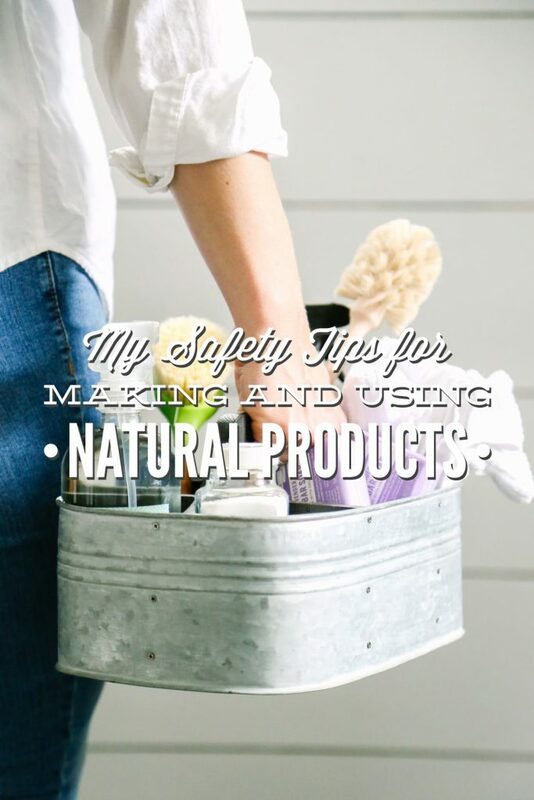 Years later, I’ve developed a few precautionary tips that I personally think about when it comes to making and using natural products. My list of tips is not meant to be an ultimate list. This is simply a basic list that I keep in mind when making or using natural products, made with natural ingredients. It’s important to do your own research and find your comfort level when it comes to making products or purchasing products, just like you do when feeding your family. Distilled (sold in stores) or boiled and cooled water is best to use for any homemade product calling for water. This process removes potential contaminants. Tap water should be boiled for 15 minutes. From my experience, filtered tap water is okay for short-term use products, which for me is a couple of weeks. If I ever notice a slime or an unusual odor/color in a bottle filled with a homemade cleaner or bodycare product (or any product, whether homemade or store-bought), I always toss the product and make a new batch. Now, I get that bacteria (which isn’t always a bad thing–says the gal who consumes fermented veggies, kombucha, and sourdough bread) can grow without any odor or discoloration coming through a product, so this where you need to use your own discretion, and why I follow tip number three. Also, you can add a preservative to a product, like lotion, that contains water. If you’d like to experiment with preservatives, I highly recommend reading this article from The Nerdy Farm Wife. If a homemade product doesn’t contain water, generally, I’ll keep it around for the life of the ingredients. For example: I keep my homemade boo-boo cream in my medicine cabinet for a year, if we don’t run out before that. The boo-boo cream is made from oils and beeswax. When a product is made with water, I make smaller batches that aren’t intended to last for long-term use. An exception to this rule is my liquid laundry soap recipe on the blog. I wouldn’t exactly call that recipe “small batch,” but when you take into consideration how much laundry we wash in a given week, a big batch doesn’t sit around for a really long time. If you’re interested in making laundry soap, but don’t want to use water, try my powder soap. I always label a homemade product with the product name and date. A simple label can be made with tape, or use a permanent marker directly on glass spray bottles and containers. There have been times when I haven’t labeled a bottle or jar, and then later wondered if the powder inside was just Borax or toilet bowl powder. Oops! I always use clean spray bottles, containers, and/or mixing tools when making homemade products. Bacteria is usually introduced into homemade products when the handling materials haven’t been properly cleaned. We have a dishwasher, so I rely on the heat from the dishwasher to help clean and sanitize my tools, particularly for something that will be stored long-term, like my makeup remover balm. I’ve also wiped out jars and bottles with a swab of 100% vinegar before adding a product to the container. I also make sure to use clean hands, or clean tools, when using and applying a product. I always spot test before using a cleaning or bodycare product. This applies to both store-bought products and homemade solutions. 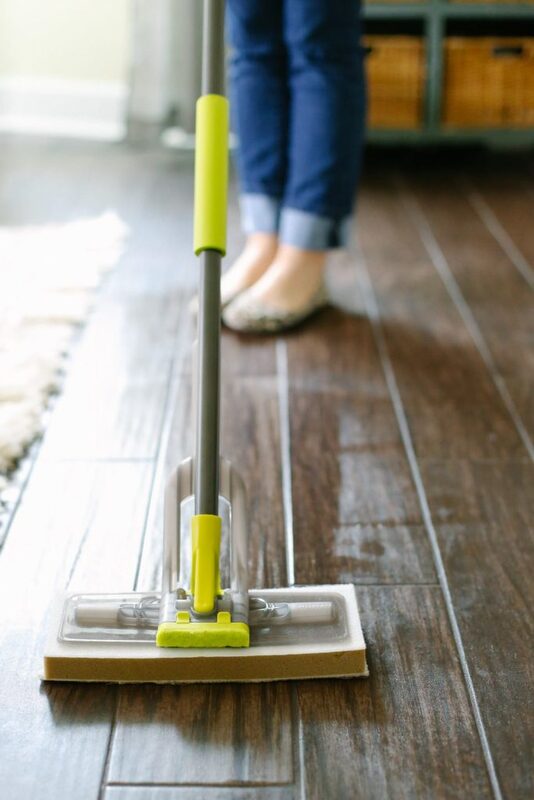 For cleaning products that are used on special surfaces, like stone floors, wood, or stone counter-tops, I recommend first spot testing in a small, inconspicuous area. This applies mainly to cleaning products. 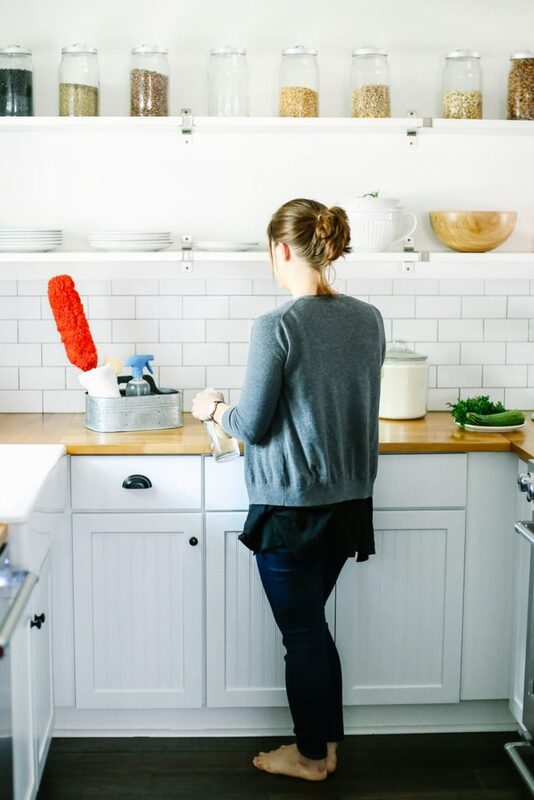 Even though the ingredients that I use to make homemade cleaning products are safe, there are a few ingredients that shouldn’t be mixed together due to chemical reactions. 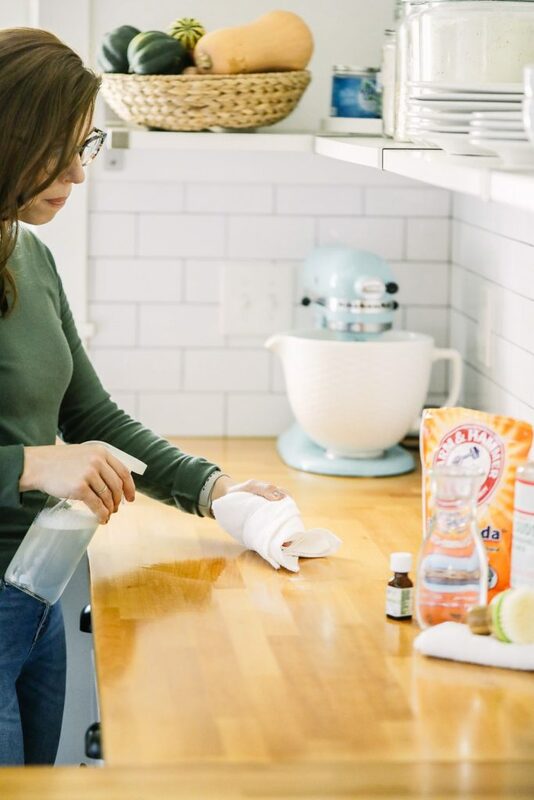 There are three notorious natural combos, using four different ingredients (baking soda, hydrogen peroxide, vinegar, and castile soap) that should be avoided. You can learn more about these combinations, here. Essential oils are all the rage these days, and for good reason. Essential oils are incredibly beneficial when used in cleaning products and on the skin. And while essential oils are incredible, it’s easy to get sucked into the plethora of ideas floating around the internet, without doing your own research. Always do your research! When using essential oils, here are the tips I keep in mind: 1) Always dilute oils whether they’re used for cleaning or bodycare–essential oils are very potent, so a few drops go a long way (here’s a simple dilution post from Mountain Rose Herb); 2) Never ingest oils, even if they’re sold from company representatives that claim this is a safe practice, unless you’re receiving a medical professional’s counsel/treatment; 3) Always consider which essential oils can’t be used around children and animals (here’s a handy list). If you’re interested in learning more about essential oils, check out my Essential Oils 101 interview post. And one last note about essential oils, I’m often asked if the essential oils may be skipped in my cleaning recipes. My answer? Yes, you may skip them. The essential oils are used for their beneficial cleaning properties, but for me, they are an added bonus. Most of the recipes will still work well without the addition of the essential oils. So if you’re looking to reduce the up-front cost of homemade cleaning products, I recommend skipping the essential oils. I would love to hear your safety tips for making homemade products, or using more natural store-bought products. Do you have any tips that help guide you as you make and use natural products? Do the essential oils have to be diluted when being used in one of your recipes. If so how do you dilute them. I got your natural cleaning and body care ebooks, and I´m already browsing through them planning my next recipes. And since I´m buying the ingredients online, I´m trying to make a list of the ones I´ll need first, and I´m definitely going to need a preservative, since your pumpable potion is on top of my list. But I,m not finding Leucidal complete in Europe, and in Portugal I´m not finding any type of Leucidal at all. Can you recommend any other? In Portugal I citric acid (well, the website says it’s a preservative), basically (is sucragel CF a preservative? ), but I found Dermorganics 1388, Cosgard 221, Rokonsal and Sharomix. Plus, I see that you use alcohol free witch hazel, which at Amazon in Europe is hard to find. I might have tracked one brand, but in case they don’t ship to Portugal, would it be terrible to use normal/alcoholic witch hazel? Hey Rute, I wish I had a good answer for you. I don’t know of an alternative, but I wonder if the company does? Maybe you could reach out to Leucidal and ask what they recommend–they may know about other options similar to their product. I’ve used citric acid before. I’m not sure how well it will preserve lotion, but it’s the one on the list I do know about. Another option is to make a small batch (small batch recipe is in the book) and store it in the fridge or a cold place. That’s what I do. Regular witch hazel is just fine to use. It can be a bit harsh for some skin, so I would test it out first. Ok, lotion, not potion, but that would be great too, haha! Thanks for the reply, Kristin. I will definetely make a smaller batch, since I’ll be the only one using it (well, maybe my son as well), although I will still try to figure it out regarding preservatives. One more question, this time regarding aloe vera juice… does it make a difference if it’s inner fillet ou whole leaf? The former is quite expensive around here, and I found one that only has citric acid as an add-on (I found others with ascorbic acid, sodium benzoate and potassium sorbate, are these safe?). For now, I’m planning to use it on the mouth wash recipe. Hey Rute, Sounds like a good plan. I personally haven’t found a big difference between the two aloes. I usually go with the one with the fewest ingredients.